George Carlin said: “Fighting for peace is like screwing for virginity.” Given the timing I assume he was referring to how the Nixon Administration ramped up bombing in order to strengthen its hand against the North Vietnamese at the upcoming 1972 Paris peace talks. Thousands of residents of Hanoi were killed with no practical effect at the negotiating table. “The wording of the [final peace] agreement was almost exactly the same as it had been at the beginning of December—before the Christmas bombing campaign, Rebecca Cesby wrote for the BBC. 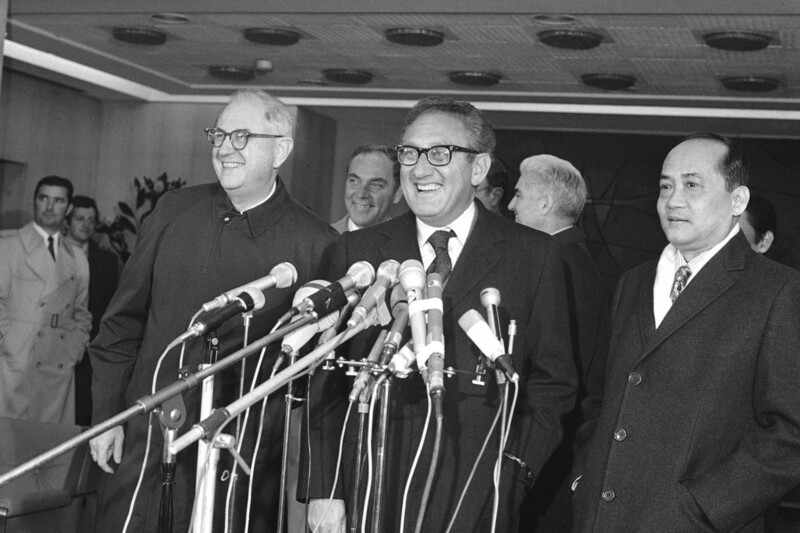 Henry Kissinger, the chief U.S. negotiator in Paris, admitted as much. “We bombed the North Vietnamese into accepting our concessions,” said Nixon’s secretary of state, never missing a chance to be droll while bathing in the blood of innocents. Here Donald Trump goes again. Bombing a military target has obvious benefits: troops, equipment, materiel and infrastructure are destroyed or damaged that otherwise might have been deployed against you and your forces. Military planners tout a more subtle theory in favor of the strategic bombing of civilians. Military planners assume as an evidence-free article of faith that blowing up urban areas accomplishes more than killing people and destroying their homes. They believe it “softens them up,” lowers their morale and undermines support for the government, perhaps even culminating in a popular uprising bringing the conflict to an earlier conclusion and the installation of a friendly new regime. The thing is, it only seems to have worked once—when Japan surrendered following the nukings of Hiroshima and Nagasaki. Like the North Vietnamese in 1972, the Taliban in 2019 read newspapers. They know they’ve won. They know that the U.S. knows it has lost. They know U.S. voters have turned against the war against Afghanistan. Bombing or no bombing, all the Taliban have to do is hang tight before the U.S. leaves and tosses them the keys to the country on the way out. Ramping up the violence now looks like what it is: a bitter, desperate, last-ditch effort to act even more like the monsters Afghans have become convinced that we are. Aside from its pointlessness and total waste of life and treasure, what’s shocking about the Trump Administration’s “killing toward peace” campaign is its utter cluelessness about human nature. Trump won the presidency by accurately reading the mood of the electorate, particularly the long-neglected Rust Belt Midwest, when Democrats and the media could not. Why can’t his Defense Department see that an escalated bombing campaign against Afghanistan won’t improve our bargaining position and could make things worse? For thousands of years in both the Western and Eastern worlds, the peace negotiations that ended the overwhelming majority of wars were concluded during ceasefires. Winding down armed conflict allowed the parties to mourn their dead, revel in their victory or wallow in loss. Most importantly, a ceasefire gives warring sides breathing space to begin to reframe their image of their soon-to-be former adversaries. Enemies become neighbors, eventually trading parties and perhaps even friends. Monstrous Others transform into who they were all along—people just like you and me. This entry was posted in Blog, Columns and tagged afghanistan, Doha peace talks, Donald Trump, Imperial Japan, Nazi Germany, nuking, RAF, strategic bombing, USAF, World War II on February 10, 2019 by Ted Rall.